The endothelium lines the inside of the blood and heart vessels. It is a thin membrane which helps regulate blood clotting, immune function and controls vascular relaxation. When endothelial dysfunction occurs, the ability to perform these tasks is reduced due to the blood vessels not functioning properly. This dysfunction transpires as a result of an imbalance between vasoconstricting substances, which narrows blood cells and vasodilation substances, which widen blood cells. In endothelial dysfunction, vasodilation is impaired and the arteries begin to lack the ability to dilate properly. This dysfunction can be a significant predictor of coronary artery disease and atherosclerosis, a chronic disease which can cause a stroke or heart attack. Endothelial dysfunction can be caused by several conditions including diabetes or hypertension, as well as factors such as smoking. However, lifestyle changes can be made to correct endothelial dysfunction, which can reduce the risk of further cardiovascular complications. There has been a vast amount of research on endothelial dysfunction and diabetes, with several studies reporting endothelial dysfunction in patients with type 1 and type 2 diabetes. A wide range of evidence suggests that this association could due to microangiopathy (disease of the blood cells) and atherosclerosis in patients with type 1 and type 2 diabetes. Brazilian researchers from the Departamento de Medicina Interna report that many factors in type 1 diabetes are associated with endothelial dysfunction. These include consistent hyperglycemia and post-prandial hyperglycemia (high blood sugar following a meal), autonomic neuropathy and microalbuminuria (early nephropathy). Jorge Calles-Escandon and Marilyn Cipolla evaluated that the general consensus suggests endothelial dysfunction in type 1 diabetes signifies a high risk of micro- and macroangiopathy. It is considered valuable to detect endothelial dysfunction early in type 1 diabetics as this can decrease the likelihood of further vascular complications developing. Casper G. Schalkwijk and Coen D. A. Stehouwer report that the function of the endothelium is impaired from the onset of type 2 diabetes. Endothelial dysfunction is closely associated with and may contribute to insulin resistance, which can lead to type 2 diabetes. Calles-Escandon and Cipolla also state there is a body of evidence linking the coexistence of insulin resistance and endothelial dysfunction. They document that patients with diabetes, individuals with insulin resistance and those with a high-risk of developing type 2 diabetes have all been previously found to have endothelial dysfunction. However, Schalkwijk and Stehouwer note that endothelial dysfunction in type 2 diabetes appears to be independent when obesity is the primary cause. Most evidence suggests that the association between endothelial dysfunction and diabetes remains to be established by scientific studies. Increased inflammatory activity, components of the metabolic syndrome and urinary albumin are thought to be closely interrelated, though. Who is most likely to develop endothelial dysfunction? Endothelial dysfunction is associated with most forms of cardiovascular disease, so if your risk of cardiovascular complications is increased, you may also have an increased likelihood of developing endothelial dysfunction. High blood pressure, high cholesterol, smoking and metabolic syndrome can all cause endothelial dysfunction, as well as a lack of physical activity. Dr. Alois Suessenbacher et al evaluated that the known increased cardiovascular risk in shift workers might be related to endothelial dysfunction. How is endothelial dysfunction diagnosed? Most doctors do not routinely test endothelial function, which is a complicated process normally conducted in environments such as university research laboratories. It can be done, however, by administering drugs such as adenosine, which normally causes dilation of the small vessels of the heart. 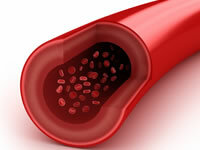 The ability of the blood vessels to dilate or constrict in response to the drug is then measured. If decreased blood flow to the heart muscle is observed, a diagnosis of endothelial dysfunction can be made.